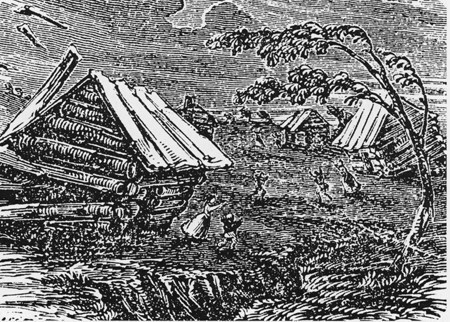 The New Madrid earthquakes, which occurred from December 16, 1811 and in January and February of 1812, was a series of four earthquakes which hit the midwest in New Madrid, which is now part of Missouri. The quakes were felt quite over more than 1 million square miles. In 1811 and 1812, the Great Comet remained visible to the naked eye for months; King George III of England was dethroned due to his long-term mental illness and was replaced by his son, George IV, who ruled as Prince Regent; Argentina declared its independence from Spain; the Luddites began to riot in protest of the Industrial Revolution in northern England, President Madison enacted a 90-day embargo on trade with the United Kingdom; and the United States Congress declared what would become known as the War of 1812. But perhaps the biggest event -- and perhaps the least remembered in this day and age -- to have taken place were the New Madrid earthquakes, an intense series of extremely large earthquakes and thousands of aftershocks which began in 1811 and ended in 1812. The prolonged, months-long event was named after the largest settlement in the affected region, which was between Natchez, Mississippi and St. Louis, Missouri in the Louisiana Territory. There were constant and numerous reports before the quakes mentioned that people had heard and felt what were described as artillery or "cannon booms" coming from beneath the ground for up to three years before the quakes. Newspaper articles about the second and third quakes make it difficult to figure out what damage and side effects are actually from which earthquake because published accounts from the time describe the cumulative effects of all of the quakes. Add to that the fact that the Ohio River was iced over by the time of the second principle quake, so there were few people on the river to report the events. The first quake, centered in northeast Arkansas, surprised everyone at 2:15 local time. Although there were no instruments to measure earthquakes in 1811, it is now estimated to have been between a magnitude 7.7 and 8.1. This tremor damaged about 600,000 square miles but shook more than 965,255 square miles severely enough to alarm those who felt it, throughout the entire eastern United States. People were shaken awake in Charleston, New York City, Detroit, and Richmond. In Nashville, Tennessee and Louisville, Kentucky, the shaking lasted three minutes. As the country was still reeling from the first one, an aftershock of approximately 7.0 magnitude, hit six hours later, at 8:15 am. What was the largest sand boil in the world until 2011 was created by the quake, and can still be seen on the so-called Missouri Boot Heel, which is the southeast corner of the state approximately eight miles west of Hayti, Missouri. Sand boils are frequently called sand volcanoes, and they are caused by pressure welling up through a bed of liquifying sand. They reportedly look like the water is boiling up from the bed of sand beneath it. This quake, as well as the other major quakes in this series, was felt in Boston, where church bells rang incessantly due to the motion. In Washington D.C. President Madison and his wife, Dolley, reported feeling them in the White House. The second quake is usually thought to be the smallest of the three large shakers. It came on January 23, 1812, with a magnitude of 7.5, centered in the Missouri Boot Heel, shaking Missouri and Tennessee in a major way, though it was felt as far away as New Jersey. It triggered severe landslides, ejections, fissures, and stream bank cave-ins. Seismoluminescence, or "earthquake lights," flashed from the undulating ground, most probably caused by quartz crystals being squeezed by the crushing and releasing of the earth. And the final quake of the series, with a magnitude between 7.7 and 8.8, was at 4:45 in the morning of February 7, 1812. The epicenter of this one was New Madrid, which was almost entirely destroyed by it. The consensus is that this was the most severe quake in the series. This last quake destroyed the town of New Madrid, and it damaged houses in St. Louis, causing chimneys to crumble. It caused temporary waterfalls on the Mississippi, caused the river to run backwards for several hours, and created Reelfoot Lake when the land heaved up, blocking several large streams. It also drowned people living in an Indian village near the Reelfoot and destroyed thousands of acres of forest. Each of these three earthquakes remain on the list of America's "top" earthquakes, and most certainly would have caused more damage to life and structures had they not been in the relatively sparsely populated Mississippi Valley. The New Madrid Earthquakes even helped to solve a murder! George Lewis, who was known locally as "Slave George," was murdered in western Kentucky during the late night/early morning of December 15-16, 1811 by Isham and Lilburn Lewis, who were nephews of Thomas Jefferson and descendants of Meriwether Lewis, who was famous for his involvement of the Lewis and Clark expedition. George was a slave, born in Virginia and owned by Lilburne, and was 17 when he was killed. The two brothers were drinking the night of the 15th when George accidentally broke a pitcher which had belonged to their mother. With seven or eight other slaves present, the two brothers tied George up and hacked and beheaded him with an axe. According to accounts of the murder -- which were scant due to the news of the earthquakes at exactly the same time -- the two planned to have the slaves who had witnessed the crime burn George's dismembered body, but while the preparations were in progress, the first of the earthquakes stuck, which caused the chimney to collapse into the fireplace around what was meant to be a pyre. The brothers had the other slaves rebuild the chimney, and when it was complete, hid the corpse in the new chimney. The subsequent quakes caused the new chimney to partially collapse yet again, and in March of 1812, a dog belonging to a neighbor apparently found the man's skull and dropped it on a nearby road. The neighbors began to put the pieces together, and they eventually discovered the murder. The torturous murder of slaves was a crime, and the brothers were arrested and charged with the murder. They bailed out of jail and according to accounts and evidence, entered into a suicide pact; however, only Lilburne died in the event. Isham was re-arrested as an accessory to the suicide, but he somehow managed to escape. It is believed that Isham enlisted in the United States Army the day before the War of 1812 was declared and was one of seven Americans killed at the Battle of New Orleans. Contains a modified Mercalli map of a 6.5 magnitude earthquake, which is what New Madrid quake was said to have been. Additionally publishes an account and discussion about that quake, comparing it to the one in Kobe, Japan. Recounts the New Madrid earthquakes with notes from frontiersman Davy Crockett and other accounts, the probable causes of those tremors, and other interesting facts. News of the December 16, 1811 earthquake from various newspapers of the day accompany links to articles about aftershocks, which continued into 1812. The US Geological Survey, the official government site which gathers and provides information about earthquakes, offers its summary of the swarm of quakes, images from the disaster, and eyewitness accounts. Search for New Madrid Earthquakes of 1811-1812 on Google, Bing, or Yahoo!